It is done. 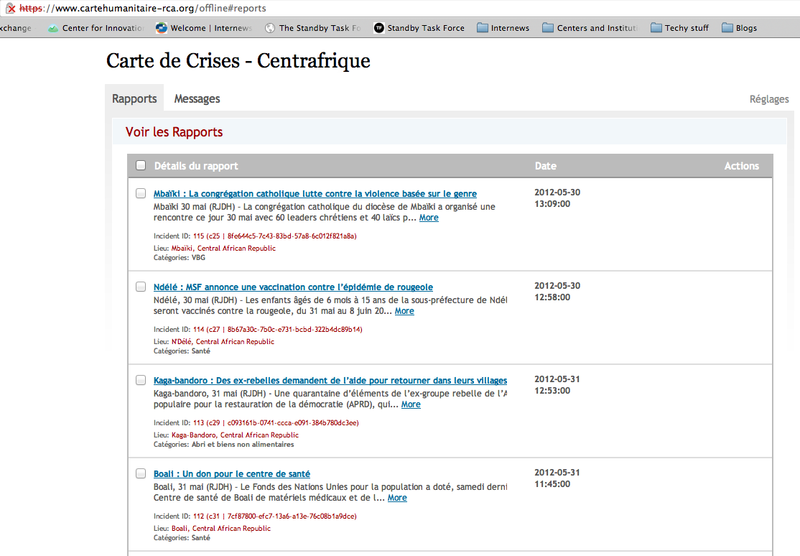 I have been dreaming about this project for the past 2 years and today, I am incredibly proud to announce the launch of the Internews Crisis Map for Central African Republic. 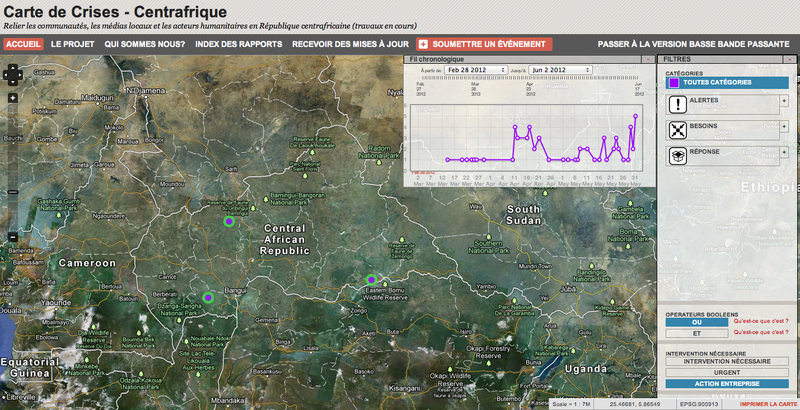 The “Integrating Local Media and ICTs into Humanitarian Response in CAR” project is a collaboration in between Internews, Ushahidi, the Association of Journalists for Human Rightsin Bangui and UNOCHA–RCA and funded by the Humanitarian Innovation Fund. This is an innovative system that comprises a bounded network of trusted local media organizations who gather real-time first-hand information from affected populations to create a two-way communication flow with humanitarians to improves emergency response, community participation and community resilience. This new media and communications system aims at increasing the efficiency, transparency and accountability of humanitarian relief efforts and increase community resilience by leveraging the relationship that local media have with their communities while being strengthened in this task by technological solutions. If you want to read more about this project you can go here and here. I am particularly proud to tell you all about the incredible (and yes most awesome awesomeness) customizations done by Robbie McKey to the Ushahidi platform we are launching today (yes yes, this will all be available on Github to be used, spread, and admired by everyone!). A big thanks to Patrick Meier as well for being so pro-active about this partnership and seeing the huge potential two years ago (together with Mark Frohardt). 1. Printing Maps: the CAR map has a printing map functionality available for three different types of pages. The big map (which is our home page); the list of report page; and the single report page. The idea behind this customization is that you can print (or save as PDF) any report you like without having to copy and paste it manually. 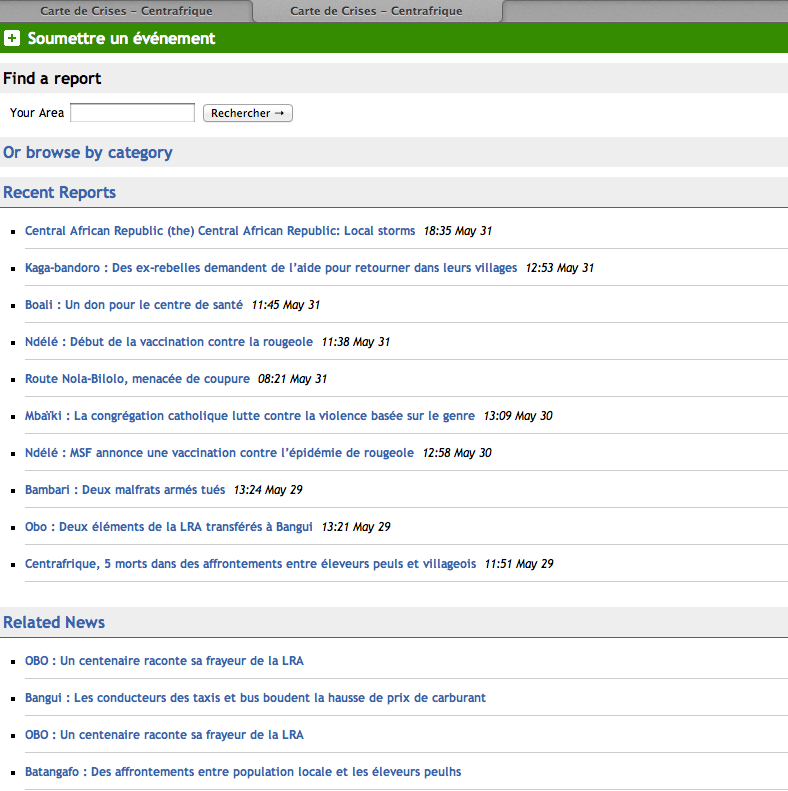 This also allows people to search for specific reports (like water needs in Bangui) and print the reports/save it. 2. Action needed/urgent and actionable plugin modification. This plugin was already created some time ago, but we tweeked it a bit. Now from the main home page, you can see only urgent reports, reports that needs to be addressed or reports that have been addressed already. This system has been developed with the ideas of allowing for a better organization in between humanitarian organizations responding to needs on the ground. 3. Low Bandwith version. This is really not a modification that we have done but just a trick. Basically you can decide to brows the entire platform as a mobile version (even on your computer). This comes extremely useful for places like CAR, where the internet connection where available, is often very weak and cannot necessarily load the entire platform. 4. Offline Version. This is the most important piece of the puzzle: this Ushahidi deployment allows users to browse all the reports and see them offline. In the incoming weeks the functionality will be expanded to allow people to actually edit reports offline and then upload the content once they have connectivity back. 5. Information Evaluation. We have changed the information evaluation criteria according to the peculiarity of the project. Since we are working with humanitarian organization and radio stations, we have decided to use the only criteria that we normally use in the media world: direct source, indirect source, I don’t know. The same has been done for the probability of the information: confirmed, not confirmed, I don’t know. 1. Change time span for report visualization. When you go the home page of the platform you will see only the reports that have been inserted into the platform in the past 2 weeks. The reason behind this change is that we don’t want to end up with a super crowded platform – since this is supposed to be a long-term project – and we also want to make it easier for humanitarian organization to find the latest information on the map. 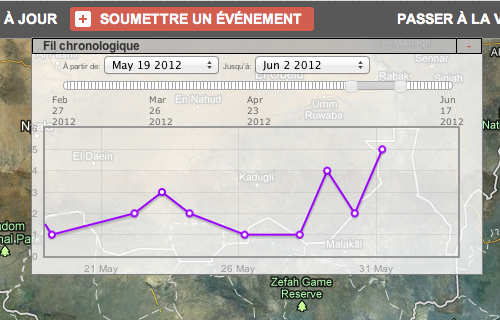 By going to the TimeLine, people can always go back to the visualization of all reports inserted in the platform. 2. 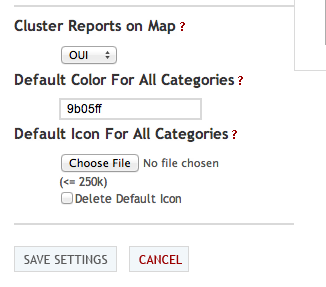 Possibility to set an icon/color for All Reports category. We ended up not using this, since we cannot find an icon that can work with all categories, but still we now can set up an icon and change the color of the All Report categories. 3. Big Map as the home page. We realized that we needed a bigger map on the home page but also that the map was our main way to add value to the feed of information that we are already collecting from the ground from radio stations. Having the Big Map as the home page we get rid of the report list, already available in the List of report page, and of the news feeds, that are now coming in only from the back end for the managers of the platform to decide what to do with it. 1. Editing information: this customization basically allows us to see who has modified what and when. The functionality that was there before was allowing admins to see when someone had opened one report from the back end and changed something. With this improved system, we can now see from a Log Report page, who has changed something but also what exactly – the field- was changed. This customization was specifically done to make sure that humanitarian organizations that have access to the platform and journalists can always monitor who is doing what and preserve the integrity of the information. This platform is an incredible achievement, not only with respect to the technology customization, but also visi-a-vis the framework of the agile development methodology that we want to use in future innovative projects in humanitarian emergencies. The technology here is just the starting point and the base for the creation of something that is entirely customized around the users and in this way designed to respond to specific operational needs. In the coming weeks we will continue working on the translation of the platform into French and to finish all the customizations (and making sure that everything is working). We will also gather feedback from the humanitarian community using the system in Central African Republic and will refine the customizations done to make sure that this is really going to become a tool that will support humanitarian organizations in their work in CAR, by providing them meaningful and actionable information coming directly from the affected communities. In September we will come back and assess what are the outcomes of this novel project are in terms of consequences for the local communities in CAR. One thing is left to say here: KUDOS to the Internews team on the ground; to the Ushahidi team; to the UNOCHA staff in Bangui; and of course to the Association of Journalists for Human Rights, who made this all possible with its incredible daily work, trying to bring better information to affected communities in one of the poorest countries in the world. This entry was posted in Crisis Mapping, Humanitarian Affairs, Media by Anahi Ayala Iacucci. Bookmark the permalink.